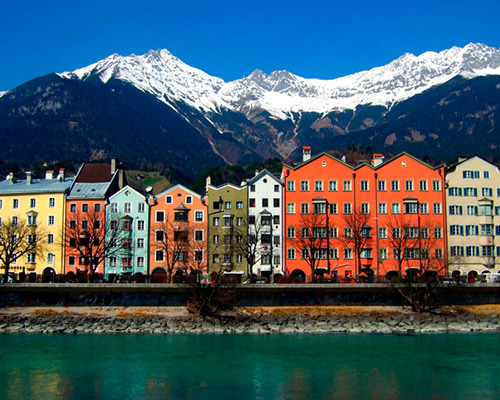 Innsbruck, provincial capital of Tyrol and fifth largest city in Austria, is the country’s centre of winter activities and occasionally of the world’s alpine interest, having hosted the Winter Olympic Games twice. The Nordkette cable car and an extensive network of mountain paths radiate from Innsbruck, making the stunning surrounding Alps equally accessible for winter skiers and summer hikers. 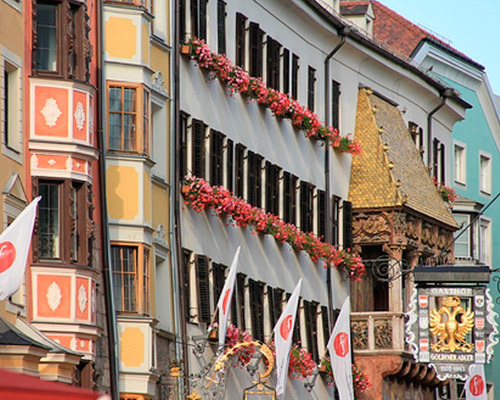 The Altstad is the centre of Innsbruck, and the Goldenes Dachl, Golden Roof, is both the centre of the Altstad and the city’s emblem. The building from the 15th century, is a mixture of Gothic and Baroque, and of course has a golden roof. The frescoes in the interior show scenes from the aristocrat's life of that time. All of the decorations on the current structure are carefully executed replicas. The original reliefs are on permanent display in the Tyrolean State Museum, also known as the Tiroler Landesmuseum. Housed in the building is the Golden Roof Museum which has an exhibition about Emperor Maximilian I and his times, as well as the history of Innsbruck's emblem. Lovers of the Gothic art shouldn’t miss the Tiroler Landesmuseum, its collection includes beautifully coloured, delicately etched stained glass windows, a few altars and paintings and an array of modern works. Maria-Theresien Strasse is Innsbruck's main street and a wonderful place to stroll around or sit at one of the side cafes and watch people go by. At one end there is the Triumphal arch which leads to the old town. Maria-Theresien Strasse is a lovely pedestrian area, with pavement cafés, Baroque architecture, restaurants, and views of the stunning mountains. Innsbruck offers a fairly unique winter holiday proposition, mixing gorgeous mountain scenery with architectural grandeur, and big city buzz with hundreds of shops, restaurants and funky bars.